Is it a carport? Is it an entertainment area? At Outside Concepts, we say why can’t it be both? If your block size is small or your budget won’t stretch to building two outside structures, combining a carport and an entertainment area may be your only choice. And with a bit of good planning and clever design, it can be a good solution, as well. 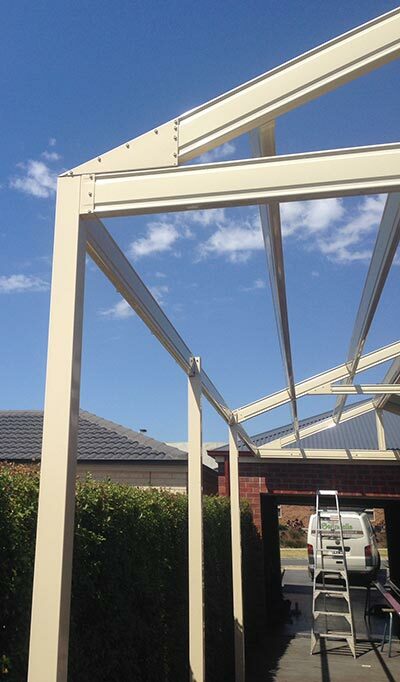 The images in this blog show the construction of a carport and entertainment area for a client in Geelong, completed by Jaan McKenzie and his team from our Western Branch. With only one side of the roof installed, the images provide a good view of the Firmlock metal beams used in the construction. The beams consist of two C-sections that lock together to form a strong yet surprisingly light beam. Firmlock is extremely durable, easy to work with and uniform, and is perfect when used as structural beams and purlins for verandahs, carports, awnings and even home extensions. And perhaps the best thing? The beams will never need painting, leaving you more time to relax and entertain in your new outside structure!